The body of missing boat captain Vasdeo Persaud was found yesterday afternoon on a Venezuelan beach, four days after the boat he was manning was set alight by pirates. Deodat Bissoon, the owner of the fishing vessel ‘Sudesh’, told Kaieteur News that he received the news at around 17:00 hrs that Persaud’s body had been found on a beach in an area known as Kamarito. Mr. Bissoon said that from reports he received, Persaud’s body was badly decomposed, but bore no marks of violence. Bissoon said that the body was discovered by some of his associates in Venezuela, who have been searching for Persaud ever since he disappeared last Thursday. Persaud, 39, of Parika Façade, East Bank Essequibo, is believed to have drowned when he and his three-man crew jumped overboard after pirates torched their fishing vessel. There are indications that the Guyanese were fishing in Venezuela waters when the pirates struck. 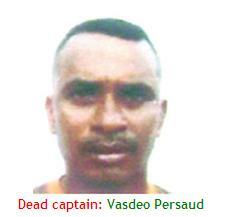 According to reports, Persaud and three crewmen, identified as ‘Pepe’, ‘Keelman’ and a third man left Parika on Tuesday. It is alleged that the crew was in Venezuelan waters at around 11:00 hrs on Thursday, when a vessel manned by four pirates, brandishing firearms, approached the ‘Sudesh’. When the crew retreated to the back of the fishing boat, the pirates sprayed fuel on the vessel and set it alight, causing some of the crew to sustain burns on their feet. In desperation, Persaud and his crew jumped overboard and began to swim towards a buoy located about a mile and a half away. However, the tide was reportedly strong and only ‘Pepe’, ‘Keelman’ and the third crewman managed to reach the buoy. Mr. Bissoon said that he was told that the men heard Persaud shout for help before disappearing in the river. Although they had sustained burns, the men clung to the buoy for hours until they were rescued by a Venezuelan vessel and taken to a hospital. The fisherman known as ‘Pepe’, who sustained the most injury, was admitted. The ill-fated vessel has not been found.